Our guest bedroom has many functions. And one of those is storage of tools and household supplies like paint, toilet paper, shampoo etc. I felt as though we weren't using the space efficiently so I spent all day Saturday organizing. One area in our life that was a problem was our tool storage. 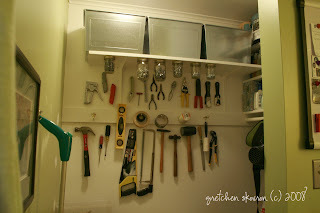 I put all the tools on the wall, now you can see if the hammer has not been returned to it's proper space. I also picked up these large silver bins in the As-Is section of Ikea which holds all of our toiletries and such. And then I nailed the lid of a mason jar to the underside of the shelf and inside each jar are nails and screws. Now we just need someone to visit so that I will finally have the motivation to paint over those last few spots of touch up.